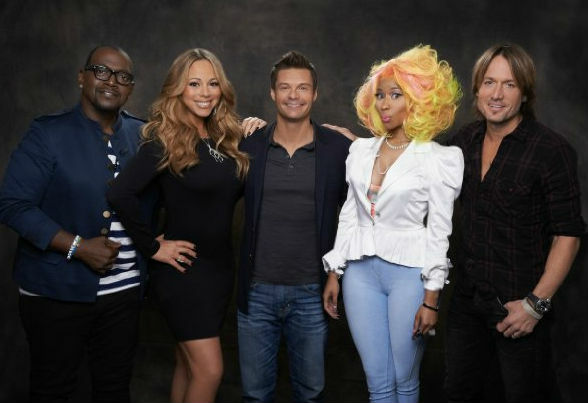 –Mariah Carey and Nicki Minaj are doing a really crappy job this week pretending to like each other. During her interview with Barbara Walters last night, Mariah called Nicki “not appropriate” and said she hired more security because of their feud. Then the pair shared the stage at today’s TCAs, where they could barely look at each other. –David Bowie will release his first album in 10 years this spring. Does this mean he’s Coachella-bound? Please? -Also, a new Prince song has surfaced online! –Kimye spent $11 million on a new home (take a look.) On the plus side, it’s far, far away from here. –How I Met Your Mother is bringing back Robin Sparkles — along with a truckload of Canadians. -Speaking of HIMYM, this fake site for the show is funnier than anything they’ve aired in years. -Brace yourself! Snooki says she already wants another baby. –Kate Winslet‘s new hubby just won a court injunction to stop a UK tab from publishing his half-naked photos. -I’m digging Emma Stone‘s Lanvin dress at the Gangster Squad premiere. -Meanwhile, Ryan Gosling‘s mom wore Eva Mendes’ clothes to the premiere, and Ryan and Emma were all kinds of cuteness together. -If I have to suffer through these creepy photos of Mary-Kate Olsen with her head in older beau Olivier Sarkozy‘s lap, so do you! –Blake Lively: still going strong with Ryan Reynolds; still not working. -I might not be a huge fan of Miranda Lambert‘s music, but I’ve got nothing but love for her refusal to let the Chris Brown thing go. –Fred Armisen admits to being a terrible husband to Elisabeth Moss. -For the first time ever, an Oscar host will announce the nominees. Seth McFarlane will be waking up early to read the names alongside Emma Stone on Thursday morning. -It turns out even former Sexiest Man Alive Bradley Cooper can’t pull off a toque.